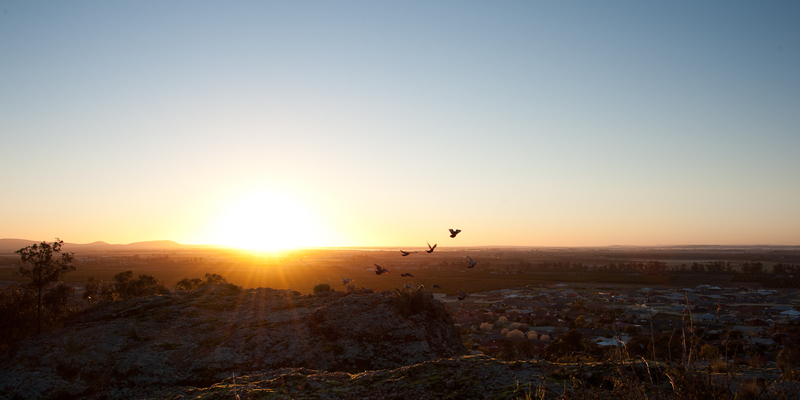 This shot was taken in the middle of winter, at a scenic lookout point in Griffith, just as the sun began to rise. As the sun came up there was more and more wildlife coming to life, so I wanted to include this in the photograph as well. In order to get nature to co-operate I had my partner stand just out of shot, clapping and yelling at the birds. This would wake them up, they would fly up and around in an arc and settle back into their nests again. So my partner would clap and just as the birds would lift I took the shot. I think they were grateful when we were done and they could stay in bed! Although nature had its revenge; the wind picked up whilst we were attending one camera, (stupidly) leaving the other camera unsupervised which resulted in a very disheartening !crash! damaging not only the lens but also some of the functions of the camera body ….. very expensive photograph in the end!